Globally, there are more than 59 million health workers; despite women making up the vast majority of the health workforce, however, men occupy the majority of leadership positions. Health sector reform started in Cambodia in 1996. After almost twenty years of health system strengthening and human resource development, the current health sector employs 19,172 health workers. Women comprise the majority of employees in the formal health system, but are less likely to hold senior professional, managerial and policy-making rolesand have fewer opportunities to retrain for new positions. As a result, women are under-represented in the management structure of the Ministry of Health (MoH), with only 20% of leadership roles occupied by women. Firstly, as there are few women in managerial, policy and decision-making roles, there are few opportunities for women’s voices to be included in health policies, including human resources for health (HRH) approaches, strategies and management systems. Secondly, career progression for women to advance through the health sector in both clinical and managerial pathways becomes difficult. This is often the result of life experiences, such as child rearing, looking after the home and family (which are often the responsibility of women), not being considered in the development of human resource (HR) policies, including career pathways. Thirdly, the majority of the population is female, and as such have unique health care needs related to their reproductive role. Given the social and cultural context, women prefer to be cared for by female health care workers. While this need can often be met at the primary health care level, when care is required at secondary and tertiary levels women do not access the care as there are few female doctors and specialists. 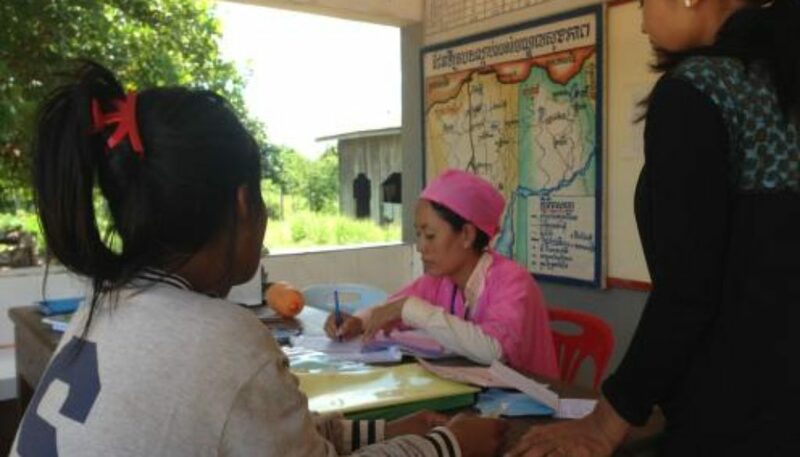 The aim of this study was to explore the career pathways of health workforce in Cambodia. Key constraining and enabling factors affecting women’s career advancement are discussed below. Juggling work and family life was a key difficulty of female managers. In particular, female managers found it difficult to combine domestic chores, such as breastfeeding and taking care the elderly in the family, with their managerial role. Coping mechanisms included leaving their job early or bringing children to work. In some cases, the female managers needed to take a break from their job for a period of time. Some male managers corroborated this view in that they believed women were responsible for household chores. They emphasized that roles between men and women within the family were defined and that women are supposed to work inside household, while men are in charge of business outside the household and it would be very difficult if this becomes unclear. At the same time, some women felt that while household responsibilities were a burden, they did not prevent them from holding leadership positions. Another constraint for women in leadership positions identified by respondents was the social norm that values men more than women in leadership positions. For example, female managers felt that their voice was less respected; being younger women and having a lower level of technical skill was also seen to influence respect received. Other managers described that though women have the capacity and qualifications, society is biased towards men and accustomed to the norms that women are not suitable for decision-making roles. Additionally, some female managers emphasized that men often dominated conversations, turning to other men in the group for input. Due to these social norms, some female leaders felt the need to work extra hard to improve their outputs, so that respect and trust could be gained. Female facility managers emphasized the need for support from relatives and spouses. Some female managers illustrated that sometimes their spouse needed to postpone their work in order to help looking after a child and giving time to their partner to work. All female facility managers acknowledged strong support from the (male) head of the local institution in providing advice, particularly in the early stage of their leadership role. Additionally, having support from junior colleagues was also seen as important for female managers. Female managers perceived that self-motivation was important to their leadership position. Some mentioned working hard as a major factor for the success, while others mentioned the importance of having the willingness to enter into a leadership position in the first place. Another female manager emphasized the importance of “thinking like men” and considered that women can do things like men as a way to motivate themselves to take up a leadership position. Other female facility managers identified capacity and qualifications as an important factor in helping women obtain leadership positions. Similarly, male managers also emphasized that capacity is crucial and could lead to higher respect for female managers. Strategies promoting equity in leadership within the health workforce need to be implemented at different levels. At the individual level, self-motivation, support from family or spouse, and appropriate capacity and qualifications of female providers all empower women to break through the glass ceiling. At the community level, gender roles and norms within the family and community need to be challenged and changed. Giving more opportunity to girls to obtain general education could be a starting point. At the institutional level, having support from male managers and colleagues who are willing to promote women in leadership helps to advance women’s position within the workforce. At the health systems level, policies are needed which support women’s advancement within the health workforce. Promoting gender equity in the health workforce requires a long vision and commitment. Without having more females in the workforce and leadership positions, the workforce may not be resilient and responsive to the needs of the entire population, particularly women. If more women are not able to enter into leadership roles, the goal of having equitable health systems will remain an unattainable objective. Research in Gender and Ethics (RinGs): Building Stronger Health Systems at #HSR2016	Gender, leadership and governance: what did we learn from the World Health Summit?